Your Hardinge spindle is in expert hands with the factory-trained, Big Plus–certified technicians at High Speed Technologies, Inc. We have repaired dozens of Hardinge spindles to original factory performance. Need it fast? We can repair your spindle within three days of customer approval, and we offer reduced pricing for longer lead times. All spindle repairs are backed by a complete warranty and our 30-year reputation of OEM-quality spindle repair. Hardinge Lathes are excellent. Their spindles provide high precision and long life. Below are other examples of HST’s OEM-quality repairs on Hardinge spindles. For expert Hardinge spindle repair, call us at 1-603-483-0333 for a quote. We are fast, experienced, and our work is guaranteed. If you have a Hardinge lathe you expect perfection. So when the part finish comes out anything less than perfect your spindle has a problem. And poor part finish was exactly what our customer was noticing. Even though production was critical, our customer didn’t wait for catastrophic bearing failure. He took his Hardinge HGA series lathe out of production and sent the spindle to HST for repair. This was the right decision. Our examination found bearings that were on the verge of total failure. But because the spindle was taken out of service before more damage occurred we were able to give the shaft face a quick kiss grind, install and set new bearings, balance everything and get the spindle out in two days. The total down time was 4 business days. If the bearings had failed and damaged a journal the repair time would have more than doubled. The performance was great. Run out on the face after our repair was less than 1 micron TIR and the vibration levels at full speed were .0.00883 in/sec on the front. Fantastic! Unfortunately sometimes it is impossible to schedule down time and sometimes failures happen fast. This spindle from the Hardinge HLV series lathe seized up when the # 4 bearing failed. The shaft journal was damaged and needed our GPG process to restore it to precise dimensions. Careful inspection showed that the inner race suffered plastic deformation. This is a little unusual because the # 4 bearing primarily reacts the belt tension forces. We did not do the original repair for the customer. So we’re a little suspect if counterfeit bearings. When the spindle repair was complete the total run-out was less than one micron TIR and the vibration at the front was 0.00560 in/sec. The Hardinge spindles are really terrific. Plastic deformation is evident in the inner race. This is indicative of severe overload or possibly inferior steel. On the right, the Hardinge HLV lathe in situ. This Hardinge spindle repair is off of a HGB-2 lathe. Besides turning very rough, the customer had dinged up the front mounting surface. They noted excessive run out in the spindle. Our examination showed contamination had penetrated the bearings and they were at the end of their service life. We also found positive signs of fretting on the back #3 bearing indicating a loose fit. The shaft and all interface surfaces were GPGed and restored to OEM standards. When we were done the spindle had less than 1 micron run out TIR. The chuck interface was perfect. Note the indications of fretting on the #3 bearing. After GPG the front of the spindle looks like new. Above are just a few examples of some of our repairs. At HST we have repaired dozens and dozens of Hardinge lathe spindles. We like them. They are truly a quality spindle. Noisy bearings, excessive run out, bad part finish, chatter marks, rough feel are all some of the indications of imminent bearing failure. If possible don’t wait for catastrophic failure to send your spindle in for repair. 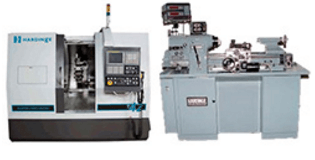 At HST we repair all make and models of Hardinge lathe and vertical mill spindles. We will only use top name brand ABEC 7 super precision spindle bearing in your repair. So if you have a problem or just a question please give us a call 1-603-483-0333 or contact us for an estimate.